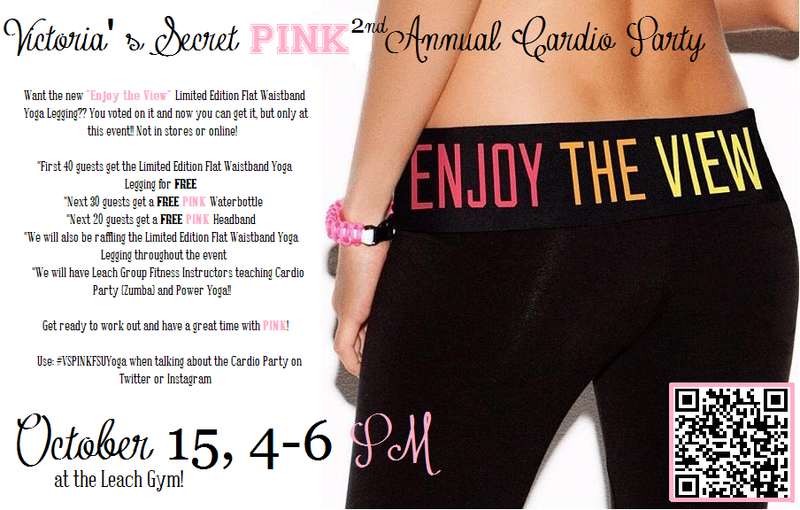 Today is our Cardio Party at the Leach (top floor basket ball courts) from 4-6 p.m. Come early for your chance to win the Limited Edition Flat Waistband ‘Enjoy The View’ Yoga Legging! ONLY AVAILABLE AT THE CARDIO PARTY! NEW Flat Waistband Yoga Legging! The Flat Waistband Yoga Legging is PINK’s newest style of yoga pants! The Flat Waistband makes for a more flattering look and it also has a little pocket in the front! You voted for the Limited Edition Pant and now we’ve got it!…but ONLY AT THE CARDIO PARTY! NOT IN STORES OR ONLINE! See #LeggingVoteOff Blog Post for details on the Legging Vote off! How do YOU wear Yoga Pants? Comment below! LOVE! I wear yoga pants for everything. They’re a perfect comfy solution that can still be cute for those lazy days of class. I like to wear them to the library to study too because they’re comfy, warm and cute. Of course, I wear them to the gym with a PINK V-neck to work out also. And they’re great for just lounging with friends. I wear my yoga pants with sandals and sneakers. I wear my yoga pants EVERYWHERE. With boots as leggings, to the gym, to class! Nothing is better the spending a lazy Sunday napping in yoga pants. So comfy! I wear my PINK yoga pants every day! I love to be comfortable and these are the best bottoms to wear whenever. It’s fun to match the colors of the yoga pants with my $2 for $28 pieces. I love to wear the yoga pant! The stretchy, comfy fabric is perfect to throw on with an over-sized shirt and to the gym. These pants are perfect for all around campus! I pair them with all of the essential Victoria’s Secret PINK tops and tanks. It’s such a cute and fashionable look, great for any plans I make! I live in my PINK yoga pants. Whether I’m going to class, to the gym or to sleep these pants make it easy to be both comfortable and stylish. PINK wants YOU to choose our limited edition yoga waistband design! @vspink instagram will show you all the cool options tomorrow and you heart your fave. The winner will be made into a super exclusive campus giveaway! 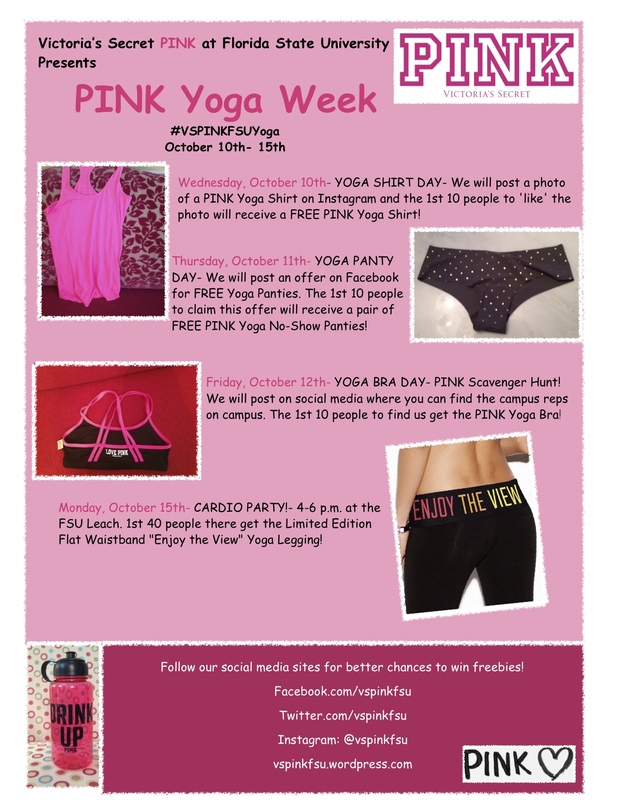 YOU WILL ONLY BE ABLE TO GET THE WINNING DESIGN AT THE VSPINKFSU YOGA EVENT…FOR FREE! Details for this event will be announced later! The new flat waistband yoga legging is available in stores now (in non-exclusive band designs)! New features of these leggings are the hidden pocket (great for carrying your ID and phone while working out) and a flat waistband which is super slimming! Shop the new flat waistband yoga legging in stores today and vote for your favorite new yoga band design tomorrow on @vspink instagram! Can’t wait for our yoga event this semester when we get to give away the winning design!